The Yungang Grottoes belong to a string of early Buddhist cave temples that stretch across northern China. 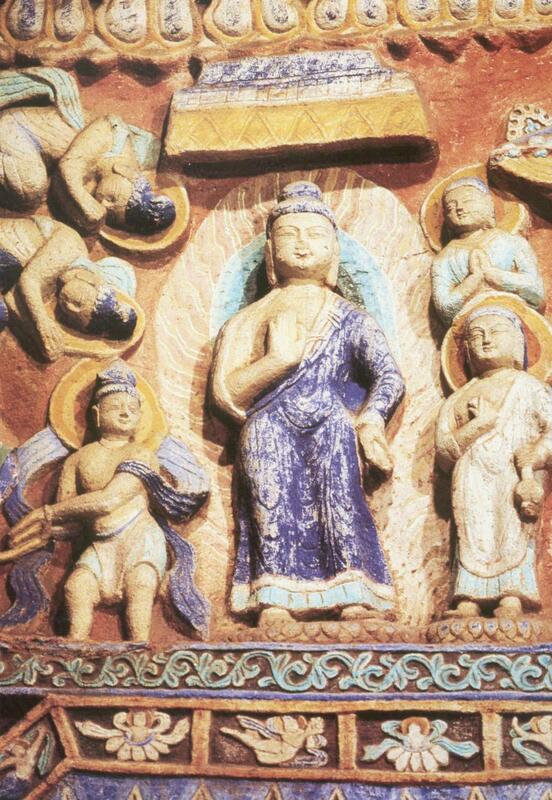 Buddhism spread east from India along ancient caravan routes leaving a lasting mark on China. Rock cave temples in China, serving as centers for Buddhist worship, date back as far as the second century with the main carving activities occuring during the fourth to ninth centuries. Other well known grotto sites include the Mogao Grottoes at Dunhunag in Gansu Province, the Longmen Caves at Luoyang in Henan Province, and the Kizil Grottoes in Xinjiang. Over 250 grotto and cliff statue sites exist nationwide throughout China being concentrated primarily along former trading routes known as the "Silk Road" and along the river basins of the Yellow and Yangtze Rivers. The Yungang Grottoes are carved into the side of a cliff in the Wuzhou hills overlooking a river valley by the village of Yungang. Yungang is located approximately 16km west of the industrial city of Datong near the Inner Mongolian border in northern Shanxi Province, China. Excavation of the Buddhist cave temples at Yungang began in 454 A.D. under the patronage of the emperor of the Northern Wei Dynasty, Wen-ch'eng. Over a period of approximately a half century, twenty major caverns and numerous smaller caves were carved out of the sandstone cliff (Mizuno, 1950; Knauer, 1983; Caswell, 1988). The largest grottoes are similar in architecture. A passageway dug into the cliff face at ground level opens into a large man-made cavern excavated behind the cliff face. These rooms within the cliff are typically rectangular, between 10 to 15m long on each side and approximately 12.5m high. At the rear of some caverns, and at the center of others there is a huge pillar that stretches from the cave floor nearly to the ceiling. This central column typically is carved into a monumental statue of the Buddha, but there are examples of pillars that take the form of a pagoda. The walls and ceilings of these caves are covered by thousands of carved, and in some cases painted, sculptures that include objects of reverence to the Buddhist faithful and tell stories of the life of Buddha. Many of the caves are built with entrances open to the outdoor air allowing abrasive windblown dust and air pollution present in one of China's largest coal mining districts to enter the caves and subsequently deposit onto the sculptures without restriction. The deposits of dust obscure features of the statues and degrade the painted surfaces. In antiquity, the entrances to each large cave were covered by a wooden temple front several stories high and one room deep. At present, only Caves 5 and 6 retain the wooden temple structures in front of their entrances. Buddhist monks on pilgrimmages used the caves, or grottoes, as places for lodging, centers of worship, and repositories for documents, sacred works, and works of art. Significant repairs to the caves were made during the 11th and 17th centuries. By the early 20th century, travelers to the area report that the caves had fallen into a state of neglect (Cox, 1957; Sickman and Soper 1968). In more recent years the caves have been cleaned, and their surroundings turned into a park. Today the Chinese government is actively trying to protect the grottoes: the Yungang Grottoes Institute has been established to care for the caves. Hundreds of visitors daily visit the site. The sources of airborne particles are many and include dust and smoke produced by operations at the coal mines and dust generated by coal trucks on a highway that runs within a few hundred meters of the grottoes. Coal combustion occurs for home cooking and heating in the village, and coal-fired locomotives run on nearby railroad tracks. Fugitive soil dust is generated by traffic on unpaved roads and sidewalks in the village of Yungang and by visitors to the caves. In addition, the caves are not far from the edge of the Gobi desert, and desert dust storms can affect the site. An extensive cleaning project was undertaken in 1986 and photos were taken of the carvings within the caves at that time (Great Treasury of Chinese Fine Arts, 1986). Comparing the sculptures today with the photographic record from 1986, there is a visible buildup of deposits, especially on upward-facing horizontal surfaces. Unless such severe particle deposition processes can be abated, any attempt to preserve or restore the sculptures in the caves may well be defeated by a continuing assault of abrasive and possibly chemically reactive airborne contaminants. Similar situations exist in many other devotional caves, decorated underground tombs, and in salt mines containing important sculptures. A common feature of these sites is that they are not well suited to the installation of conventional mechanical air conditioning and air filtration systems. In order to understand how to break the chain of events leading to the particle deposition problem in unconventional ways, a thorough understanding of the cause and effect relationships leading to the problem first must be constructed. The purpose of this project is to establish new methods for the measurement, characterization and control of coarse airborne particle deposition within caves, tombs, and certain non-air conditioned buildings that can be described as having a single entrance open to the outdoor polluted atmosphere. In brief, our approach will be to determine the concentration, range of particle sizes, and chemical composition of the coarse atmospheric particles found near important museums and archaeological sites. Measurements and modeling of the rate of the transport of coarse particles from the outdoor atmosphere to the indoor atmosphere of caves, tombs and other single entrance air spaces will also be undertaken to improve our understanding of the processes that govern coarse particle deposition onto interior surfaces. Over the course of the study we will be developing faster, more efficient methods to measure and monitor particle deposition rates onto surfaces. Finally, "passive filtration" techniques will be developed to remove coarse particles from the atmosphere before they enter the historical sites of interest. 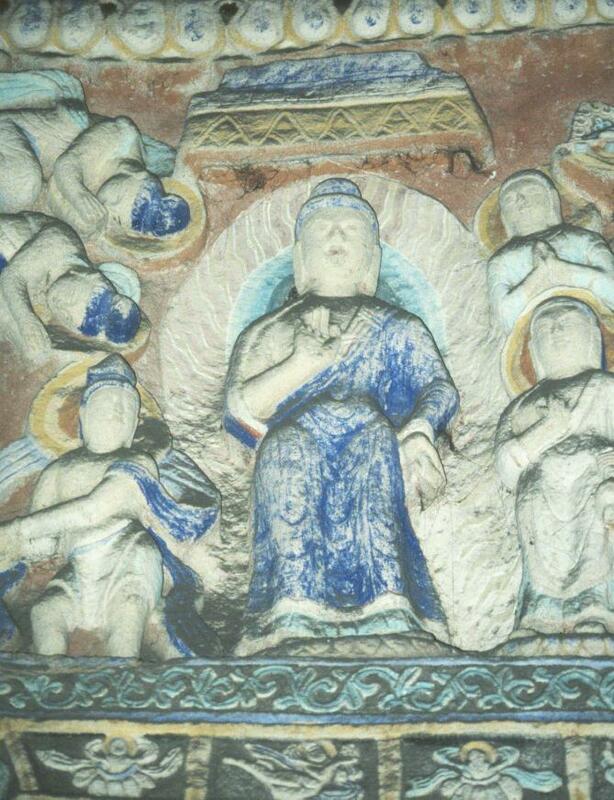 Extensive monitoring on site at the Yungang Grottoes, Datong, China was conducted in 1991. Samplers were employed to obtain data on airborne particle concentrations and chemical composition outside the caves and inside two of the caves, one with a wooden pagoda temple front and one without. Measurements were also made of the concentration of certain gaseous pollutants that could affect the painted surfaces including SO2, NO2, HNO3, HCl, and NH3. The experimental program was designed to obtain baseline data on air quality both inside and immediately outside of the Yungang Grottoes. These measurements help to define how much dust and smoke is present in the outdoor air, and what fraction of that material is found inside the caves. The size distribution of airborne particles was next determined. This information is crucial to engineering calculations needed for control system design. Particle deposition fluxes to both vertical and horizontal surfaces within the caves are also measured. This allows deposition rates measured during the 1991 experiments to be compared to historically observed deposition rates and quantifies the actual problem that needs to be controlled. Understanding the fluid mechanics of air exchange that brings airborne particles into the caves was explored. The air exchange that transports outdoor airborne particles into the caves was measured, along with indoor/outdoor pressure differences and the cave wall/air temperature differences that cause this air exchange. The purpose of this work is to document the air exchange in the Yungang Buddhist Cave Temples, and to develop a capability to predict flows under the influence of changing environmental conditions such that, in the future, estimates can be made of air exchange if the temple fronts are modified. A mathematical model to study the fate of atmospheric particles within the Yungang Grottoes was employed. This model combines all data and helps in understanding the particle deposition processes in the caves. The character and origin of the dust deposition problem at Yungang was examined. The chemical character of local sources of particles released to the atmosphere is studied as a possible means of identifying the presence of material from specific sources within the deposits in the caves. A study of community-wide deposition patterns at more than 20 sites on both sides of the river, with particular emphasis on the role of coal truck traffic on nearby roads as a source of fugitive dust was performed. By mapping the spatial distribution of the particle flux in the countryside surrounding the grottoes, areas of the highest deposition flux can be found that indicate close proximity to a major particle source, thus identifying the source itself. The overall purpose of this work was to characterize the exposure of the grottoes to air pollutants in a manner that will establish a basis for the future protection of the grottoes from air pollution damage. Strategies that can be used to reduce the particle deposition within the caves include reduction in the particle concentrations in the outdoor air and removal of particles from that air by filtration as the air enters the caves. Caswell, J.O. (1988) Written and Unwritten: A New History of the Buddhist Caves at Yungang University of British Columbia Press: Vancouver, Canada. Cox, L.B. (1957) The Buddhist Cave-Temples of Y\"un-Kang \& Lung-Men The Australian National University, Canberra, Australia. The Great Treasury of Chinese Fine Arts (1986) Peoples Fine Arts Publishing House, Shanghai People's Fine Arts Publishing House, Cultural Relic Publishing House, and China Architecture Publishing House: Beijing, China; Vol. 10. Knauer, E.R. (1983) The fifth century A.D. Buddhist cave temples at Yunkang, North China. Expedition, 27--47. Mizuno, S. (1950) Archaeological Survey of the Yun-Kang Grottoes. Archives of the Chinese Art Society of America 4, 39--60. Sickman, L., and Soper, A. (1968) The art and architecture of China, Yale University Press, Pelican History of Art, New Haven and London. See my list of publications for more information. I spent the months of April through June, 1991 working and travelling in China, and the following is an edited version of the journal I kept while I was there. 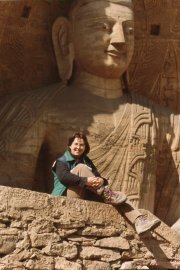 I spent the first month working on an air pollution study in Yungang Grottoes. After working for a month, I was joined by my husband, John, and we set off heading west along the "silk road" until we reached Pakistan. We ended our trip by travelling along the Karakoram Highway and flying home from Lahore. The departure from LAX on JAL to Narita went quite smoothly despite 170 kg of excess baggage and arriving at check-in only 20 minutes before the flight left. I was travelling with two people I work with, Christos, a graduate student at Caltech, and Po-Ming, a research fellow at the Getty Conservation Institute (the sponsor of my research). We had several crates of equipment that hadn't been ready to ship in advance to China, and we were worried what the airline security would make of all these little electronic gadgets we were carrying, but they didn't bat an eye at the weird stuff in my bags going through x-ray and instead concerned themselves with the buckles on my shoes setting off the metal detector. We were to have a "forced overnight" in Japan. The flight landed on time, and I cleared immigration with no difficulties, receiving a 90 day Visa for Japan in the process. Christos' Cyprus passport caused some confusion and required him to get an additional form and wait in line a second time, but otherwise he had no trouble also getting a 90 day Visa. Po-Ming was an entirely different story, however, since he holds a Taiwanese passport. Evidently, Japan does not recognize the government of Taiwan, and while an application for a visa could have been filed in advance, this hadn't been done. Eventually, after several hours, they did allow Po-Ming some type of temporary shore pass and escorted him and us to the hotel bus. We only had one hotel voucher from JAL with all three names on it. The next day we had a short flight and arrived in Beijing in the early afternoon. We were met by Shen Wei Wei, a representative of the Bureau of Cultural Relics. She whisked us through customs and took us to the Capital Hotel where we will stay for the night. There we met another representative from the Bureau, Mr. Li. He is supposed to speak English but hasn't yet. Mr. Li and a driver immediately took us out for a whirlwind tour of Beijing since none of us had been there before. It was Sunday afternoon and traffic was very light. In fact, there were very few people out in Tiananmen Square which seemed deserted, and we were the only Westerners to be seen. We finished our tour at 6pm and went back to the hotel where we met Glen, my boss, who had taken another flight. I received a strange recorded wake up call of some sort shortly after I had gotten up. My bathroom seemed to develop a mysterious problem overnight turning into a steam bath. It is now very warm and the humidity is too high to enter wearing my glasses without them fogging up. There is also a substantial leak coming in from the room above. I'm glad I'm checking out this morning. Shen Wei Wei rounded us up at 10am to go to the train. On the way there I saw three bicycles each hauling a cart with a piano, quite a site. The train station had many people and their luggage gathered outside, apparently camped for days. I'm not sure how the system works but we seemed to just get on a train and take over a compartment. We bought tickets when the conductor came around. A soft sleeper car is quite nice. There are four comfortable berths with bedding and a supply of hot water and cups for making tea. We glimpsed a bit of the Great Wall on the way to Datong which is the nearest major city to Yungang Grottoes, about 200 miles west of Beijing near the Inner Mongolian border. The terrain has been dry and looks similar to the San Gabriels, plus lots of farms and brick housing and people in blue jackets and power lines running everywhere. The announcements on the train PA are ceaseless (later in our journeys we figured out how to turn it off). I had 16 weeks of Chinese before coming, but I can't follow much of the announcements. I can, however, pick out individual words, whereas I think it would have sounded like gibberish without the course. As we left Beijing I was able to read the Chinese characters for Nan Kou (south mouth). Taking some Chinese proved invaluable later as we were travelling on our own in China. I found the language extremely difficult to pronounce, but just knowing some simple phrases like "please," "how much," "I want," "thank you," understanding the numbers, and being able to read the Chinese characters for the towns and places we wanted to visit was crucial. We also found most Chinese people we dealt with more than willing to try and help us and make an effort to understand what we were trying to communicate. We arrived in Datong just before sunset. Everyone from the train seemed to be in a tremendous hurry to get out of the station as fast as they could. Though they did take time out to stare unabashedly at these strange foreigners on the platform. Fortunately, we were met by a large crew of people from the Grottoes staff who helped with our baggage and we were taken 16 km west to the Yungang Guest House, our home for the next 30 days. Things are happening so fast I can't keep up with my journal. I'm also going to greatly condense the 30 days of stuff I wrote about working at Yungang and get on to THE TRIP as that's where I imagine more interests lie. Our work went more smoothly than we ever dreamed possible. We had been planning the project since May, 1989 and had done similar studies locally and at the Grand Canyon, but the China project was going to be considerably bigger in scope and over a shorter period of time, and too far from home to run back to the lab for that piece of tubing we forgot. Fortunately, we didn't forget anything, and we were even able to make all of our equipment function on the somewhat erratic Chinese power supply supplemented by two 5000 Watt generators for the more sensitive instruments. We had the great experience of working with several enthusiastic and eager Chinese staff from the Grottoes plus some visiting chemists from Beijing. Mr. Li who we met on our first day in Beijing has really warmed up and has become a laugh a minute (half in English, half in Chinese, plus pictures and body language.) We have a couple of interpreters brought in whose English skills are pretty marginal, not necessarily better than the chemists and engineers they are supposed to be interpreting for who all know a little English (at least as much as I know a little Chinese). We haven't found communication to be very difficult as a lot of our work is capable of being learned by watching and we draw pictures and point a lot. One of our interpreters is a young geologist from Taiyuan (capital of Shanxi province). His favorite actresses are Shirley Temple and Phoebe Cates, a weird pair if you ask me. Another person is a geophysicist and supposedly has only studied English for 3 months, but he is one of the easiest people to communicate with. We also have the wonderfully sweet Miss Li, a chemist from Beijing who is very quick to pick up on anything and chatters to me constantly in Chinese. The local electrician was a particularly impressive individual as he stripped wire with his teeth, and generally doesn't bother with circuit breakers. We typically were working 18+ hour days and sometimes round-the-clock for 48 hour intensive sampling events and we never got any protests from any of the Chinese staff who were always by our sides. We did notice some power struggles between the underlings (the scientists and engineers) and the people "in charge" who were typically only high school educated, and some of the Chinese felt a need to be careful of what they were saying in the presence of others. Meals were an important ritual and we soon learned the Chinese take great stock in eating precisely at the same time every day. We could keep them awake helping us work all night without a complaint, but make them five minutes late for lunch and the restlessness and looking at watches would become very noticeable. We had a chef who put out a tremendous feast for every meal. Evidently you haven't been fed enough unless you're given about three times what it's possible for you to consume. Seating was always a little weird. We, being honored guests, were always at the #1 table which got served first and would be joined by special guests like the mayor from time to time, depending on how many guests there were, people would be bumped up or down from the other two large tables (each with about 12 people) depending on how they ranked. We got to take a slight breather from work and explore our surroundings a bit. The town of Yungang has two main streets. One runs parallel to the front of the caves which extend for about a kilometer. The other road comes out perpendicular forming a "T" and this street has most of the shops and the post office, a bunch of pool tables, etc. The rest of the town is clumped around the area and has narrow paths throughout. We went to the post office and tried to mail some letters. This was the first time we had tried to spend any money since Beijing. There are two types of currency in use in China. Renmibi (RMB) is the local currency that the Chinese use. Then there are Foreign Exchange Certificates (FEC) that people like us get when we exchange hard currency. In theory 1 RMB = 1 FEC, and in practice this is fairly true though in some places the locals have a preference for FEC's and a minor black market exists that will trade ~1.1 RMB for 1 FEC. Yungang, however, being somewhat off the beaten track doesn't know what an FEC is and the people in the post office after much study conclude that it's not real money and won't accept it. One of the Chinese staff eagerly offers to exchange some RMB for us and we are able to send our letters. This proves necessary at the local stores in Yungang as they don't recognize FEC either. Christos led us on a desperate search for coffee taking us to every shop in town. None to be found, however. The shops all had an odd assortment of goods, each very much like all the others. They had beer, cigarettes, flashlights, tea, soda, peanuts, shoes, sewing gear, sardines, and a few other items, sometimes film or cooking pots. One cigarette package had an interesting picture of a dinosaur on it. We had one official "day off" during our stay. On this day we were escorted all over the province to see the sites. We took a mini van, and fortunately our driver stopped in the morning to buy a spare tire because we had a flat later in the day. I'm not sure how he could tell at the time, though, since the road was so bumpy I couldn't tell the difference between riding on the flat vs. the good tire. One of the places we went was the hanging temple at Hengshan. It is a remarkable structure perched precariously on a cliff. A boulder that fell in the 1989 earthquake was pointed out to us. It is embedded about 6 inches beneath the sidewalk. We also saw the Wooden Pagoda of Yingxian County, a 9 story tall hexagonal pagoda built entirely of wood. No nails! We also visited the house of the director of the hanging temple. It was very nice, spotlessly clean, six rooms around a courtyard for just his immediate family (wife plus two children and a dog). The place is heated with some type of recirculating water system running under a raised platform above the floor. We were told that it cost 23,000 Yuan (~$4,400). Of course, it was probably the best house anywhere in the region. We also had one of the best meals I experienced in China, 13 dishes for 9 people (the usual amount of leftovers) which cost a total of 100 Yuan (~$19). Work continued falling more or less into a routine pattern for the rest of the period. My husband, John, showed up on April 26 having a small adventure in the process of getting to Yungang on his own. At last the time came to say goodbye to the friends we had made and everyone got into gift giving mode during the last couple of days. I had taken a lot of books with me (for all that spare time I never had ;-)) and I gave most of them away as gifts.